You’ve dumped 5(-ish) semesters of knowledge into your tired, jumbled brain. You’re fresh off of finals (maybe not feeling so fresh), and now it’s time. It’s your first day at your new clinical rotation, and you have no idea what to expect. Here’s where I was that day: I had changed my outfit 4 times but ended up wearing the first. The clinic exuded all the classic, mountain-town-chill-vibes you would expect in a rural ortho setup above the local pizza joint, but I felt nothing but stomach-wrenching stress. What was my CI going to be like? Am I expected to be awesome? I don’t feel awesome. I should have done my laundry. Should I ask a lot of questions, or does my CI want me to demonstrate what I know? Your first couple of clinicals are a practice in how to reconcile being a student with being a professional. On one hand, you want to establish rapport with both your patients and your soon-to-be colleagues. To me, this means showing everyone that I am comfortable, competent, and have every special test for every joint under my fingertips. The problem is, I never know what’s under my fingertips! Student-me is still woefully inexperienced when it comes to handling actual patients. It’s difficult to assess and palpate a patient when you’ve only touched your very “WNL” classmates. 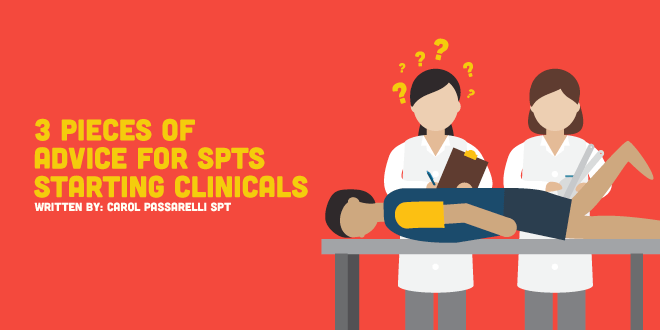 Beyond that, even if I COULD remember the specificity and sensitivity of every test in PT school, my student brain still doesn’t know how to clinically interpret a patient’s history and exam to extrapolate next steps in their treatment. 1. You aren’t the clinician you want to be…YET! From what I’ve gathered over the past month, a big part of finding the balance between being the ultimate prepared student and that perfect professional is letting go. Let go of the expectation that you will be the best student your clinical instructor has ever seen. Also, let go of that image you have of yourself as a clinician in five years—you know, the one where you’re already a leader in the PT field, winning awards and staying perfectly up-to-date with all research articles. Hah. You are NOT the clinician you are going to be—and that’s okay! The likelihood that you and your CI have a perfectly paired teaching-learning style is slim to none. If you finish your first week and feel like you’ve made mistake after mistake, remind yourself that your CI may not know you need more positive affirmation for all the little things you did right. Or, maybe, your CI assumed you knew more than you did and you felt stranded with a patient. In that case, you might need to set up a time to talk to your CI and tell them more about your academic comfort level. Transitioning from didactic coursework to fieldwork—while also fulfilling university coursework, prepping for your CI’s questions, and somehow managing to grocery shop and workout—is impossible without some mistakes. What we’re doing is difficult. My biggest piece of advice (and my own personal goal) is to leave my ego at the door and remember that my career is to learn awesome stuff every day. Good luck to everyone in the clinic, and good luck finding your balance between student and professional life!